The seventh annual Bowhunting Roundtable event featured writers and manufacturers who gathered for three days of product discussion and testing. This article is courtesy of Archery Business. Archery Business regularly showcases tips, techniques and information geared to help those involved in the business of archery stay profitable! Subscribe to Archery Business today. The seventh annual Bowhunting Roundtable was held in Barry, Illinois, on May 12-14. The event featured writers and manufacturers who gathered for three days of product discussion and testing; of course, members of Archery Business were on the scene to keep you abreast of all the exciting new-gear offerings. Bohning’s Mike Collins was excited about the new Bohning Crester, which boasts a 220-440 RPM range for 5/16-inch shafts. In addition, the new Crester sports a reversible pattern rest with English and metric measurements along with US and International power supplies. Source Outdoors’ Aaron McCaleb demonstrated Celestron’s FireCel; an innovative three-in-one product that contains a flashlight, hand warmer, and a cell phone charger. Ideal for the fall woods, this handy device was a big hit at the 2014 Bowhunting Roundtable. Ameristep was proud to showcase its new-for-2014 Bone Collector Man Cave. Engineered for sitting or standing bow shots, the Man Cave boasts large shoot through mesh windows and an Offset Hub design. With a shooting width of 88 inches and standing 84-inches tall, this blind is ideal for taller hunters or those looking to take to the field with another hunter. Cajun Bowfishing’s Sucker Punch tips the scales at 3.2 pounds, boasts a 7.25-inch brace height, and measures 32.25-inches axle to axle. With a peak draw weight of 50 pounds and draw length adjustable from 17 to 31 inches, this rig fits most any archer looking to skewer a few fish. Designed to be light and durable, the Sucker Punch is equipped with a Fishing Biscuit Arrow Rest, Cajun Hybrid Bowfishing Reel, Cajun Blister Buster Finger Pads, and a pair of White Fiberglass Piranha Arrows. Graham Johnston of the Source Outdoor Group proudly displayed the Barnett Raptor, one of the most economical crossbows in the Barnett lineup. The 150-pound draw weight Raptor propels bolts downrange at 330 feet per second. Compact and light, the Raptor appeals to the small-framed shooter as well as those who hunt from ground blinds and tight treestands. Also impressive was the new Razr. Packed with loads of innovative features, the Razr hits speeds of 400 feet per second and comes with a skinning knife built in to the bottom of the stock just below the grip. Chris Hunter of New Archery Products displayed the new Apache Grid Quiver and new Apache Tribal Quiver, as well as the new Apache L.E.D. Stabilizer designed for use on predators and when bowfishing. Also impressive was NAP’s new SpeedFletch. In typical Hoyt fashion, the cutting-edge bow manufacturer brought an impressive compound lineup to showcase. Available in 30- and 34-inch models, the Carbon Spyder is fast, forgiving, and extremely smooth. The Spyder’s aluminum riser counterpart, the Faktor, also comes in 30- and 34-inch models and sports Hoyt’s radically advanced Z5 Cam. 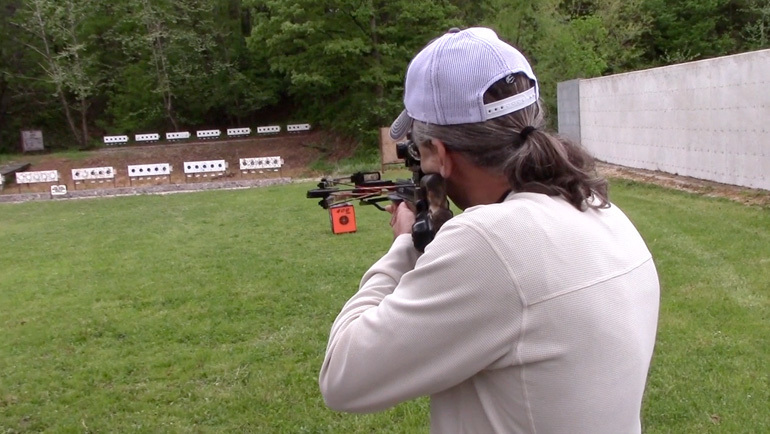 Media Direct’s Mark Sidelinger was on hand to talk about TenPoint’s new Venom crossbow. Fast and compact, the Venom sports TenPoint’s popular Functionally Superior Bullpup stock, new 19.9-inch carbon fiber barrel, and supercharged XLT limbs. Alex Gyllstrom of Scent-Lok was proud to show off the manufacturer’s new-for-2014 Vortex Windproof Fleece. The Vortex is lightweight, durable, and showcases Carbon Alloy. Carrying a $129.99 price tag, this garment was designed to help bowhunters fly under the olfactory system of big bucks. Adak Trailers created a serious buzz with its tank-like, four-season, off-road trailer. With features like all-composite paneling, torsion bar suspension, and all-aluminum running gear, this rig was designed to take you far off the beaten path.